On most ordinary dives, if things go wrong the diver can simply ascend towards the safety of the surface. That is not an option when there is a cave or cavern roof overhead. In cavern diving, the divers keep the entrance of the cavern in sight at all times. As long as they keep the window of blue daylight in view, they always know their way out to safety. Cavern diving is not for everyone. The open space of the ocean is replaced by a dark and claustrophobic world where the range of vision is only that lit up by a diving light. 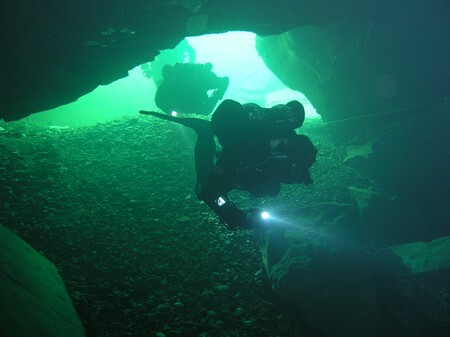 Cave diving is a serious business because there is usually no access to the surface and no easy route out. The only way out is to follow the route back to where you came from. Without lights, the diver is in total darkness. Only those who have been specifically trained should undertake cave diving. It requires meticulous planning. Cave divers use the rule of ‘thirds’ when organising their air supplies. One third of the available supply is used to enter the cave, and the second third is used to exit it. The remaining third is always kept in reserve. They often carry their tanks slung on their hips. This allows them to get through narrow constrictions and to have ready access to the tank valves. Closed circuit rebreathers are popular with cave divers since they use less gas and increase their range. Often, a cave is prepared by building a base camp, where gas supplies and other equipment is stockpiled. Caves are often labyrinths, so cave divers reel out a line to follow on the way back. Because it is absolutely dark, guidelines have to be laid. Lines have to be securely tied off at points along the route so that they keep their position. They have to be marked with direction arrows to show which way is out. It must be possible for a diver to feel these arrows in case he or she needs to find the way out in total darkness. The diver who loses the line out of the cave loses their life. It’s as simple as that. Cave divers need to take a lot of alternative lighting with them. They must be equipped with plenty of spare lighting. They usually wear helmets to help cope with the hard surfaces they may unexpectedly meet in the dark. Explorers that venture farther into caves use diver propulsion vehicles (DPVs) to pull themselves and all their equipment through the water. Caves are usually filled with fresh water, and because there is no light, there are few life forms in it. This means the water has a clarity that must be seen to be believed.